Vladimir does not have an own website but this nice design, so I decided to share a bit of my webspace. Design, images and analysis are the property of UR5EAZ. You find his email address at the end of this site. designer you find Vladimirs email address on the end of the page. 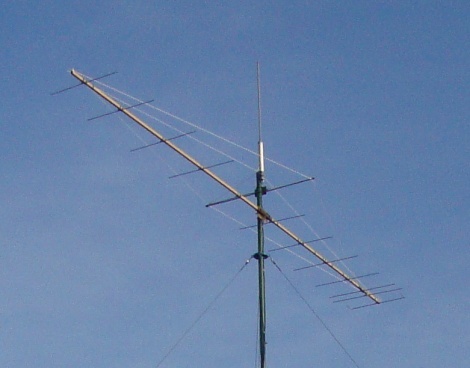 The Yagi prototype is built on a plastic lace dim. 24 x 28 mm as boom, elements are mounted on plexiglass [acryl] platforms on the boom. Mechanical Designer: my friend Oleg UT4EU. Oleg - a very good mechanic. He has all the tools for precision work. Tnx Boris UA9TC for his RS-reflector in Yagi." -3 dB H-plane         32.6 deg. -3 dB E-plane         35.2 deg. Simulated layers of water, snow or ice are derived at by manipulating numbers for Dielectricum of wire = element insulation and its thickness. Contact Vladimir via if you wish for more details.